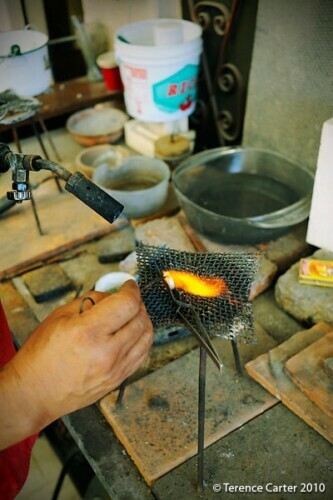 Getting lessons in silvermaking in San Miguel de Allende is one of the top priorities of many long-stay visitors to the charming city north of Mexico City. It was on my list of things to do too. 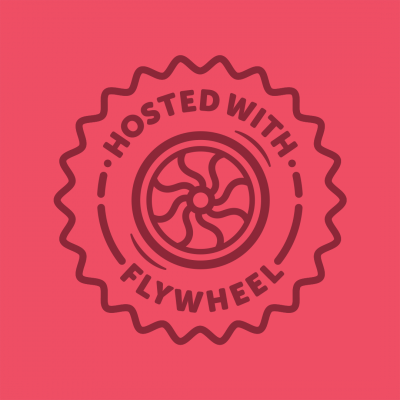 Many kinds of courses were suggested to us when we arrived in San Miguel de Allende, from dancing at Arthur Murray’s to pilates and yoga, but I wanted to learn something relevant to the town and culture and as we only have two weeks in each place this year I needed something short-term. San Miguel has long been a destination for artists, art students and expatriates and has a buzzy art scene with galleries and art spaces dotted all over town, a theatre, and plenty of cultural events, including a short film festival and a chamber music festival that was finishing just as we arrived. It was a Peruvian artist, Felipe Cossío del Pomar, who established the first art school in San Miguel de Allende, the Escuela Universitaria de Bellas Artes in 1938, which later re-opened as the Instituto Allende, and it was American expats who were responsible for the boom in arts tourism. In the late 1940s, American GIs, realising they could stretch their educational grants further in Mexico (where, at the time, rooms cost just $10 to rent and maids $8 to hire a month!) flooded San Miguel to study art. Life magazine covered the phenomenon in a 1948 story ‘GI Paradise: Veterans go to Mexico to study art, live cheaply and have a good time’ and soon after some 6,000 veterans arrived to study art in the town. In the 1960s, Jack Kerouac, William Burroughs and Allen Ginsberg also headed to San Miguel for some creative experimentation of a different kind, drawing more attention to the town. Their pal Neal Cassady, upon whom Kerouac’s lead character Dean Moriarty in On The Road is based, died after passing out by the railway tracks outside of San Miguel after a night of excess. The Instituto Allende is still the first choice for many art sudents and has a fantastic reputation, offering a range of courses including traditional Mexican weaving, drawing and painting, and silverwork, but many courses are four weeks long and I needed something shorter. San Miguel was a key stop on the silver route, the Antiguo Camino Real, the road used to move silver from the mining cities of Guanajuato, Zacatecas, San Luis Potosi, and Mineral de Pozos, to Mexico City and the Atlantic coast. The town is dotted with silver shops and jewellery-making workshops are offered by a number of galleries. I decided to get a taste of the silver making classes offered by Jose Antonio Lopez, the son of master silver maker Enrique Lopez Larrea, a professor of silver-smithing at the Instituto Allende for almost 50 years. A civil engineer by training, Antonio worked in what he admits was a dull government job before he decided to join his father at his craft. His father taught him and Antonio would assist his dad in his classes at the Institute. 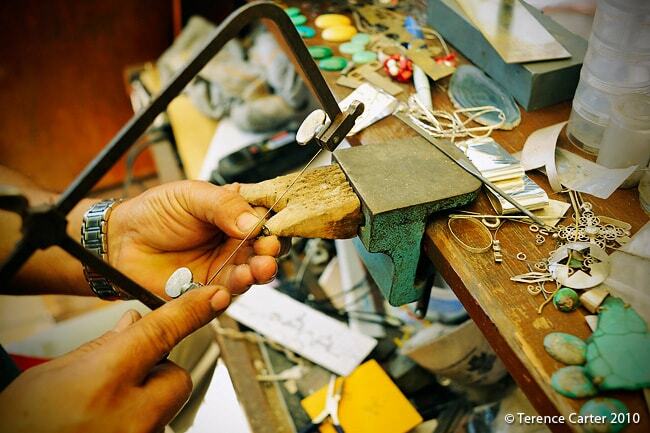 Antonio has now been making jewellery and teaching silver making for 16 years. 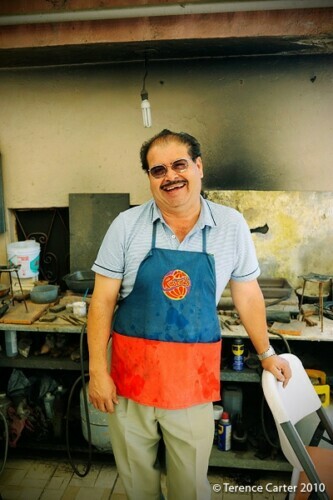 Antonio works in an open-air studio above his home, on a covered balcony overlooking San Miguel de Allende. 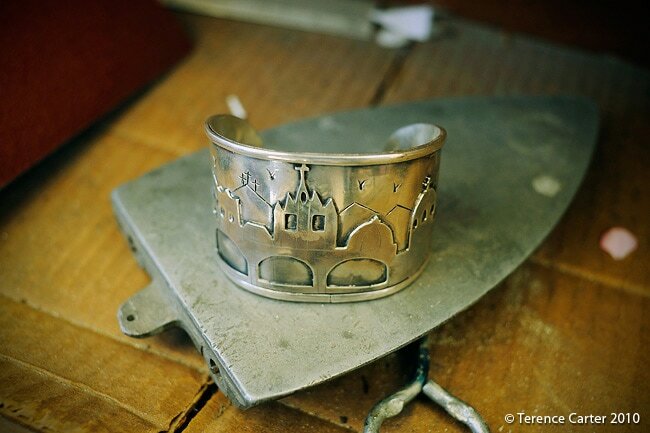 The view over the rooftops inspired one of his most popular and most recognisable pieces, a wide silver bangle bearing the San Miguel skyline and its famous parrocchia (parish church). Antonio shows me some of the jewellery he has created – pretty earrings, rings and bangles, as well as money clips and key rings. At the start of each class he shows students his jewellery to get an idea as to what they’d like to make. 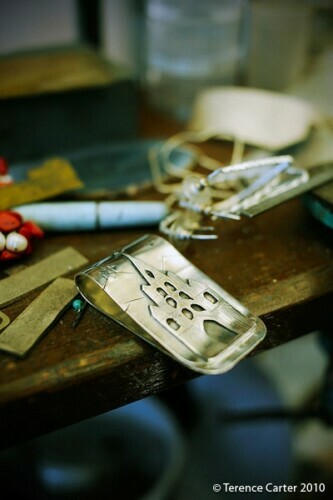 Antonio takes me through the process of making a piece of jewellery. 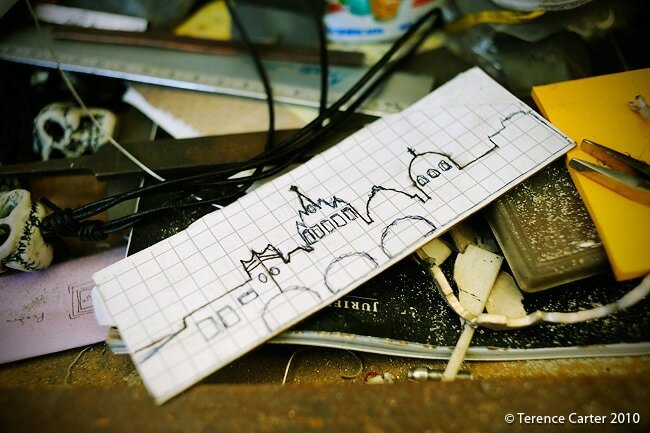 First he creates the design on paper, from which he then makes a brass pattern. 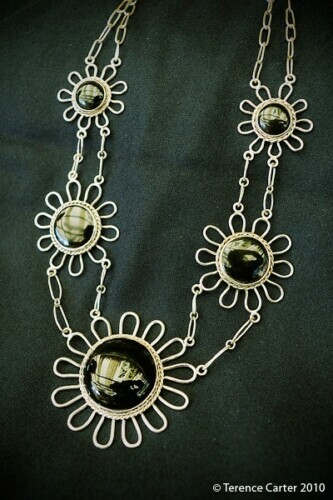 Next he looks at the gems or stones he’s working with and makes a setting with the soft pure silver bezel. Then he creates the base, whether it’s an earring or ring, there will always be a solid ‘base’ of some kind. There’ll be some soldering to do at this point, and filing will be next to finish the piece. Antonio will then put the close-to-finished product in acid for ten minutes to clean it and remove any rough edges or marks. Lastly, he’ll give it a polish, and, set any gems or stones if there are any to be set. While Antonio works quickly and with ease, not everyone is cut out for jewellery making – soldering, for example, is a bit that many students find challenging. Antonio is fairly flexible in the way he runs his courses. His workshops are open to all levels and are kept small, to guarantee plenty of one-on-one tuition. Antonio’s studio has all the tools and equipment you’ll need. 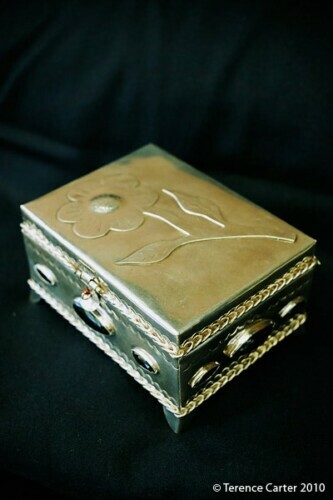 You just pay for the course and the materials, which are all Mexican (the silver comes from Toluca), although you’re welcome to bring your own gems or stones to set. 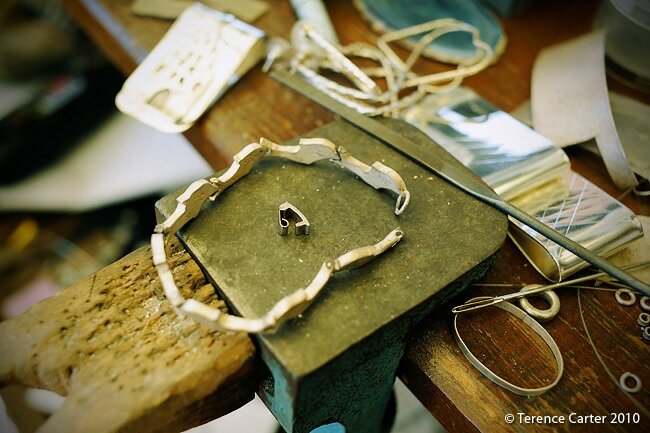 To complete the full silver jewellery making course, students should plan to attend 36 hours over four weeks, ideally three sessions of three hours each, three days per week, however, shorter courses and class periods can be arranged. Antonio offers workshops from 9am to noon, Monday to Friday.